FRIENDSWOOD, TEXAS (April 3, 2012) – Big Splash Web Design has created a custom mini-site for AMOCO Federal Credit Union, based in Texas City, TX to celebrate the credit union’s 75th anniversary. 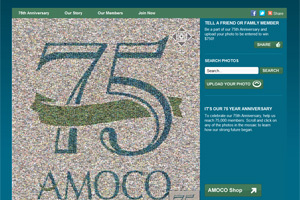 The new site, http://anniversary.amocofcu.org, is designed to highlight AMOCO FCU’s members, their growth, and their history through an interactive photo mosaic. AMOCO FCU came to Big Splash with their request for a specialty site built around a photo mosaic similar to the one at eHarmony. The credit union loved the features of the eHarmony mosaic, and wanted similar features which would allow credit union members to submit their own photos and stories. Big Splash partnered with the company that designed eHarmony’s mosaic — Picture Mosaics — to create the new site for Amoco FCU. Big Splash built the mini-site around the mosaic, and created an interactive photo timeline of the credit union’s 75-year history using both photos and videos. By partnering with Picture Mosaics, Big Splash was able to provide a time- and cost-effective solution for Amoco FCU, one of their on-going clients. Since being first chartered in 1937, AMOCO Federal Credit Union has grown from $28,000 in assets and 169 members to more than $543 Million in assets and approximately 59,000 members to date. 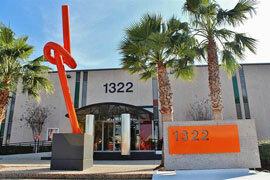 Recognized as one of the largest credit unions in the Houston/Galveston, Texas area. Picture Mosaics creates custom photo mosaics for all print and multimedia genres. The company engineers the latest software and design techniques to allow their digital designers to build photo mosaics that are both technical and artistic marvels. Their products include prints, jigsaw puzzles, interactive mosaics, large scale murals, and full motion video mosaics. The company is continually developing new, cutting-edge products and applications. More information about Picture Mosaics is available on their website, www.picturemosaics.com. Big Splash Web Design and Marketing is a full-service web design and internet marketing agency located in Friendswood, Texas. 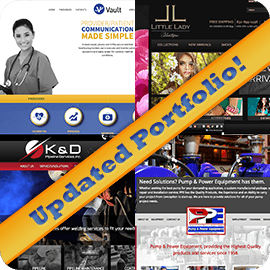 They offer custom web design, mobile applications, search engine optimization (SEO), email marketing, social media marketing, and graphic design.